Happy Independence Day! As you know, this holiday referred to as the Fourth of July or July Fourth, is a federal holiday in the United States commemorating the adoption of the Declaration of Independence on July 4, 1776. Celebrating this special moment, we are so excited to offer discount 20% OFF on ALL purchases of our products. 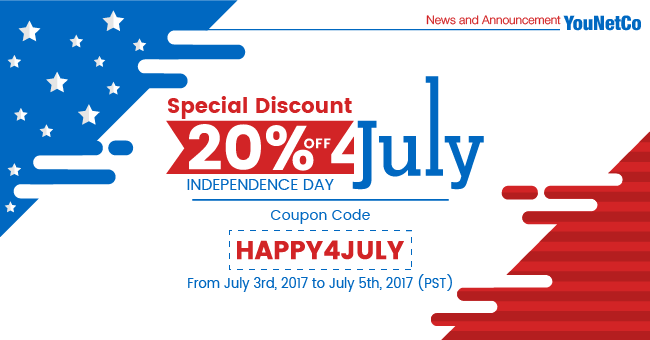 The coupon code is HAPPY4JULY. Since this coupon code is only valid in 3 days from Jul 3rd, 2017 to Jul 5th, 2017 (PST), please take this opportunity to purchase our fantastic products for your SE site. We hope that you are interested in this news. Please keep watching our blog for more updates. Have a good holiday and don’t forget to join us on this promotion.